Girona’s 53rd annual flower festival has been taking place this week, drawing good crowds of locals and visitors to the city. It is — as usual — well organised with lots of interesting exhibits, concerts and other activities interspersed in and around the Barri Vell (the old town centre). It’s a great opportunity to amble around the streets as well as get free access to many public & private buildings, churches, gardens, and museums. There is an excellent web page for the Temps de Flors -look in particular at the gallery of pictures of earlier festival and festival posters. 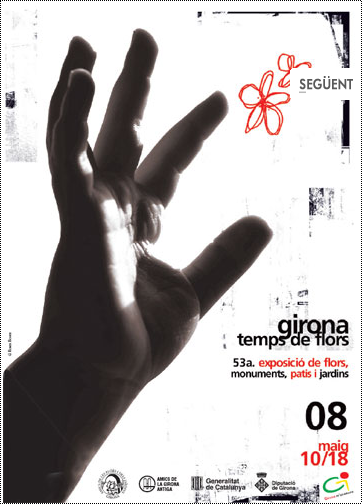 The town’s many bookshops have copies of the book “Girona Temps de Flors: 50 anys de cartells 1955-2005”, Col.leccío História de Girona 35, Ajuntment de Girona [ISBN 84-8496-004-8]) which is well worth buying as a souvenir. Last year the festival week took place in unusually hot weather and by the end many displays were unsurprisingly looking rather tired; fortunately this year’s rain on the opening and final weekends has only slightly dampened some activities & displays. But is there a sense that the format needs revamping? There is nothing really dramatic or memorable this year, nor was there last year. It’s important to keep the festival’s core visitors, but perhaps this is the time to increase its attractiveness and relevance to a wider range of visitors and residents. First, take part of the festival out of the town centre, specifically by having some exhibits and shows in nearby Salt’s own old town centre. This would be an opportunity to draw upon Salt’s more dynamic and diverse communities’ cultures, (for example, this week there is a festival of African films — AFRICAT — in Salt), and to bring the two town centres and peoples closer together. Second, install some exhibits on nearby walks or cycle routes, such as the Girona-Olot and Girona-Quart sections of the classic bike route the Ruta de Carrilet Olot-San Feliu de Guìxols on the banks of the River Ter and River Onyar respectively. Other potential sites include the extensive allotments and woods of San Eugenia (Hortes de San Eugenia), and the ecosystem bike routes at the end of the San Daniel Valley. Third, give the festivals a theme – for example emulate the 2050 Garden exhibit at this year’s Chelsea Flower Show which looks at plants and gardens in a changing climate. Much of Catalunya’s wealth is drawn from tourism and built upon the high public subsidies (much provided by the EU following the restoration of Spanish democracy) for infrastructure and public sector construction. Now it is time for the town council to start to decarbonise the local economy and tourism: free public transport in Girona and Salt, plus town bike schemes are long overdue.